Wait! Don’t go away without reading the recipe! Yes, I know – I don’t eat kale either. Hear me out and then decide what you want to do. Try your best to let go of any assumptions you have about kale. I hear one either loves it or hates it as a cooked green. I don’t do many cooked vegetables in general so I’ve honestly never tried it cooked in traditional form. But I don’t particularly care for cooked spinach so I figure I wouldn’t really care for any of the cooked greens. 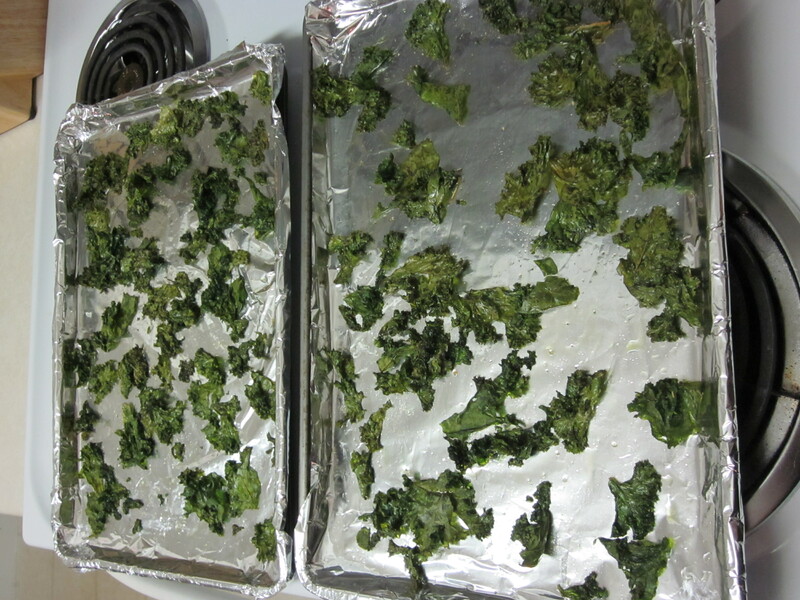 However, every food blog I read had a recipe about kale chips at some point in the last year and they each referenced at least one other place they had seen them. I thought to myself that I might as well try them – I do like chips after all. The first time I made these I was totally astonished. Blown away. Dumbfounded. Speechless. Confused. Surprised. Delighted. 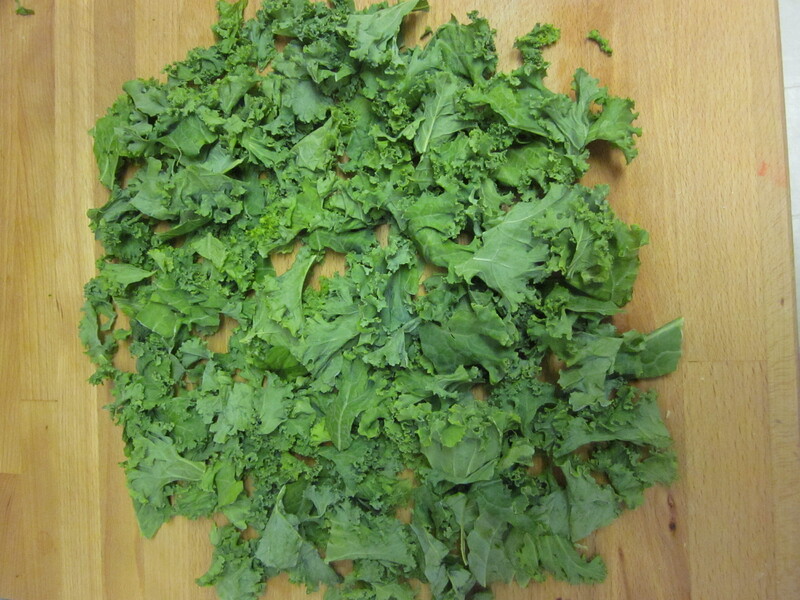 Baking the kale turns it into this impossibly thin, crunchy wafer of vegetable goodness. I like my veggies crunchy; do you? In that case – honey, this recipe’s for you. 1 tsp (or a bunch of shakes – however you measure) of your preferred chip/crouton seasoning. I do recommend it contain salt. 1. Rinse and dry off the kale. It’s important to get as much moisture off as possible. Preheat oven to 300 degrees. 3. Combine your oil and salt/seasoning in a roomy bowl. 4. 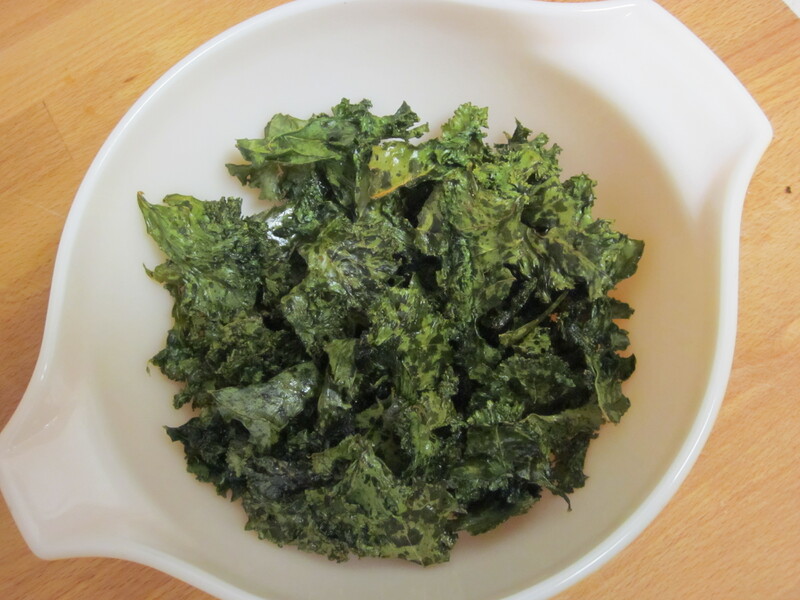 Using the best kitchen tool you have – your hands – toss the kale around in the oil, getting seasoned oil on both sides and into the curls of the leaf. Watch for pieces that fold over on each other. They can be sneaky. 5. 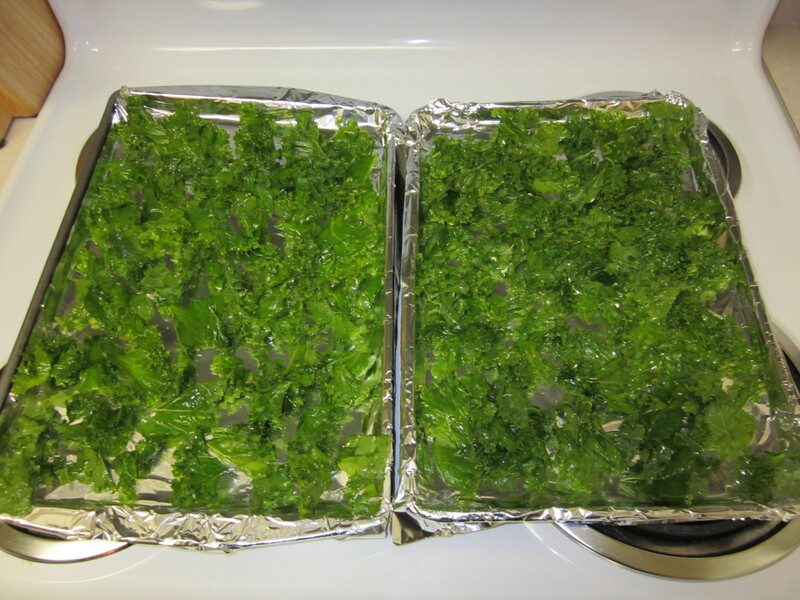 Put the leaves on a cookie sheet (I foil line mine – personal preference) in a single layer. It’s okay to crowd a little, but don’t over do it. 6. Put in the oven for about 12 minutes. I usually check mine then to see if they need to be flipped or unstuck from the pan. If they don’t seem quiiiiite crunchy just yet, give them another 2 minutes, maybe. 7. Bring them out and let them cool. They will harden a little bit more upon cooling. 8. Eat them, trying to contain your disbelief at the presto-change-o that happened in your oven. They come out so freaking small! It’s sort of like vegetable matter Shrinky Dinks…except without the thicker part. I had absolutely no idea that was going to happen the first time I made them. I picked one up and nearly crumbled it because I wasn’t being gentle enough. I sniffed it, deemed it aromatically acceptable, and ate it. It crunched and was salty and delicious. No lie, I had to restrain myself from consuming the entire sheet pan. Whodathunkit? I did try them a second time with parmasean cheese on some and ranch dressing mix on the other half. For a variety of reasons, I recommend sticking with seasonings. I also prefer them salty. Please be warned…they do NOT taste like potato chips. Some woman on one of the aforementioned blogs commented that hers didn’t taste like potato chips. …. Uhm. Well. They aren’t potatoes, dearest, so it’s highly unlikely they’d taste like potato chips. *eye roll* They do taste sort of green, but in a good way. I do encourage you to give them a try – I suspect you’ll be pleasantly surprised! Happy eating! PS – I just realized today every recipe I’ve posted is vegetable based…which is kind of funny given that I’m not a big veggie fan. My next recipe is a meat one and Mexican inspired too. You should get excited now. And then come back to see the deliciousness in print. How long do these keep? I’m fairly certain I would be the only one in my house eating them. But I love a good, salty snack. I think I will try these. Julie, the first batch I ate within 2 days. The second batch, I forgot about and a week later decided not to eat them. This batch is on day 3 and I’m comfortable eating them. Just keep them in a airtight container, I think. They seem to go pretty quickly.